Approximately 640 Southern Illinois University Edwardsville students were treated to a hearty breakfast Sunday night, served by SIUE administrators, faculty and staff. 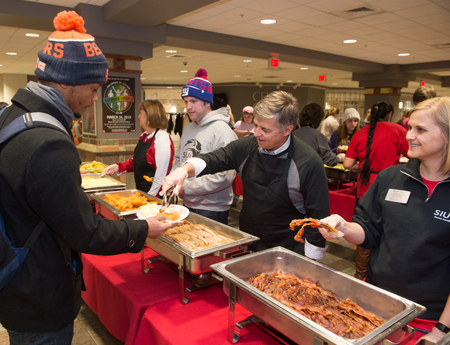 SIUE Chancellor Randy Pembrook, Vice Chancellor for Student Affairs Jeffrey Waple, and Provost and Vice Chancellor for Academic Affairs Denise Cobb, joined approximately 30 faculty and staff members to dish out a wide spread of food, and wish students well as the semester comes to an end. The menu included French toast sticks, scrambled eggs, hash browns, turkey sausage, bacon, fresh fruit, pastries and juice. The Morris University Center, Kimmel Student Involvement Center and University Housing have sponsored the late-night breakfast event since fall 2013. Photos: SIUE Chancellor Randy Pembrook serves junior Nicholas Haley, of Springfield, during the late night breakfast. (L-R) Stephen Oke and Erim Yanik, both mechanical engineering students, enjoy a delicious late-night breakfast courtesy of SIUE’s Morris University Center, Kimmel Student Involvement Center and University Housing.